If your doorbell rings this time of year, there’s a fair chance that it’s a neighbor, bundled in layers, bearing a cellophane-wrapped plate of homemade caramel or frosted cookies. It’s the season for these folks to make their way around the block, balancing plates and towing kids, sharing piles of chocolate dipped pretzels, almond cookies and gingerbread. It’s the Neighbor Plate, the Utah equivalent of caroling – with less crooning and more calories. This tradition might have evolved from the frustrating inefficiency of standing at a wide-open door in the middle of a Utah winter. It’s difficult to enjoy the seasonal charm of carolers when all you can think about is your furnace turning on. The beauty of the Neighbor Plate is that it takes just a moment to pass and doesn’t involve wet boots on your hardwood floors. For seasoned residents of northern Utah, it’s a social grace born of climactic necessity. I’m not complaining. I’ve happily devoured crunchy twice-baked anise biscotti, lightly sweet cardamom bread and soft German ginger cookies that are singing of molasses and decorated with beads of crunchy white frosting. These are foods that fall under the category of chicken soup and cinnamon rolls for me … foods that communicate love. Except for the fudge. I don’t especially enjoy the gritty blocks of streaked sugar you get at places like Ye Olde Candy Shoppe. They tend to give me a sugar headache and pain my molars. So when I see them on the neighbor plate, I tend to avoid them. But last year I received a fudge that I actually liked – smooth and creamy, cut into soft nickel-sized cubes with a butter-rich chocolate flavor. It inspired me to try making some myself. 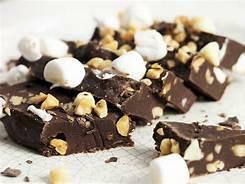 The only ingredients necessary for fudge are sugar, water, a little bit of chocolate, and something to prevent sugars from getting grainy – corn syrup, cream of tartar, or vinegar. Believe it or not, adding butter or milk doesn’t change the texture of fudge. True fudge is different from candy like suckers or taffy. In those, you get a smooth texture by prohibiting sugar from forming crystals. With fudge, you allow the crystals to grow, but not to get too big. These tiny microcrystals feel smooth on your tongue. The key is in the cooling. If you stir or bump the sugar mixture as it cools, introduce air bubbles, pieces of dust, or even undissolved sugar, then giant, gritty crystals begin to form and your fudge is ruined. It’s kind of tricky. I tried three batches of my own with mixed success before I begged for my neighbor’s recipe. When I finally had the precious paper in my hand, I was shocked. It wasn’t true fudge at all. She fudged her fudge. My neighbor’s recipe relied on marshmallow cream for the smooth texture and soft bite. And it wasn’t complicated … you cook sugar, butter, and evaporated milk, then add chocolate and marshmallow cream and pour it in a greased pan. If I would have thought to look at the back of the marshmallow cream jar, I’d have seen the recipe. I came to discover that there are a lot of ways to fudge… shortcuts that circumvent the whole sugar chemical process. This year I’m just going to wait for my friend to share her delicious fake fudge on a Neighbor Plate. And she’ll enjoy my peppermint bark and coconut macaroons … whether she likes them or not. Good neighbors are like that.